Baylor has been women's college basketball's dominant team all season, and is the rightful favorite for this weekend's Final Four in Tampa. 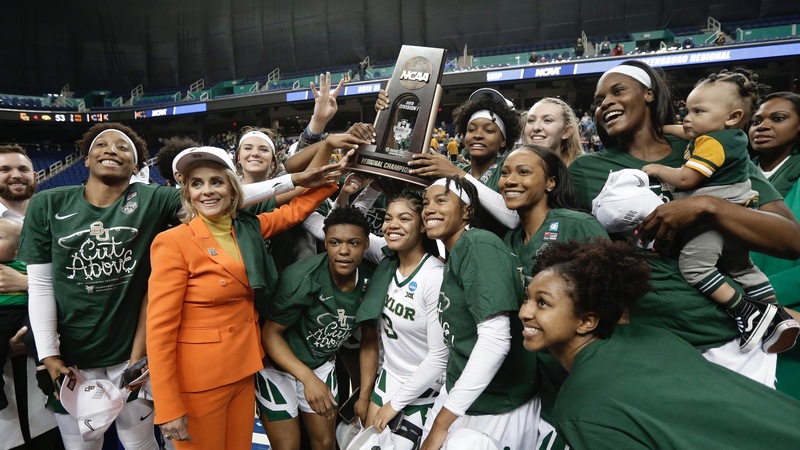 Baylor has been women's college basketball's dominant team all season, and is the rightful favorite for this weekend's Final Four in Tampa. But standing in the Lady Bears' way is UConn, which will be playing in its 12th straight national semifinal, and defending champion Notre Dame and last year's hero, Arike Ogunbowale. <a href="https://www.youtube.com/watch?v=_3LGh7fOSoo" class="embedly-card" data-card-width="100%" data-card-controls="0">Embedded content: https://www.youtube.com/watch?v=_3LGh7fOSoo</a> No. 1 Baylor (35-1) is a -125 favorite as of Thursday afternoon at the Westgate SuperBook to win its third title in school history (2005 and '12), and will play No. 2 Oregon (33-4) in the first semifinal on Friday as a 7-point favorite. The game, which will be played at the home of the NHL's Lightning and has a total of 147.5, is scheduled to tip at 6 p.m. CT on ESPN2, with UConn-Notre Dame to follow. The championship game is scheduled for 5 p.m. CT Sunday. The Lady Bears have won their [four NCAA Tournament games](https://www.ncaa.com/brackets/basketball-women/d1/2019) by an average of more than 38 points per game, but the Ducks just knocked off top-seeded and two-time defending national finalist Mississippi State in the Elite 8. The top-seeded Irish (34-3) beat Stanford -- the only team to beat Baylor this season -- to reach its sixth Final Four in eight years. Notre Dame is a 2.5-point favorite over UConn (35-2), which is trying to win its 12th national title, which would break a tie with the UCLA men's program for the most in Division I college basketball. The total is 161. The Huskies beat No. 1 Louisville in the Elite 8, avenging one of their regular-season losses (they lost by 11 to Baylor on Jan. 3). UConn has won its last three games in the tournament by a very un-Husky-like nine points per game. Should Baylor or Notre Dame win the title, that program will become the only one other than UConn and Tennessee (8) with more than two. Should Oregon make an unlikely run to the championship, it'll be the first Pac-12 school to win it since Stanford in 1992. __MORE:__ [Men's Final Four prop bets](https://www.betchicago.com/final-four-prop-bets-cassius-winston-jarrett-culver-ty-jerome) | [Texas Tech futures tickets could crush PropSwap records](https://www.betchicago.com/texas-tech-futures-bet-odds-propswap-sale-price-record) ## NCAA women's Final Four odds Baylor: -125 Notre Dame: 5/2 UConn: 4/1 Oregon: 12/1 __PLAY:__ Our [free-to-play $1,000 Chicago Baseball Northside and Southside contests](https://betchicago.chalkline.com).